The Greg Norman designed course launched the inaugural Amputee Long Drive Championship July 2013, and the sport has featured Amputee, Blind, Paralyzed, and Traumatic Brain Injured athletes since that time. The field is loaded with top ParaLong Drive athletes Jared Brentz, Brendon Jacks, Alan Gentry, Josh Williams, Dr. Lucian Newman III, Tracy Ramin, USMC Ret Lcpl Thomas Maneely, US Army Ret Spc Jason Speer, Humberto Reyna – North Carolina State Highway Patrol Master Trooper (Ret. ), Tyler Bunn, Dean Jarvis, and others. Brentz and Jacks engaged in an epic duel last May at the ParaLong Drive Nationals that saw both hitters eclipse the 400 yard mark, Brentz ultimately prevailed at 409 yards to Jacks’ 401 yards. Gentry, Williams, Newman, and Ramin have won many golf championships with their prodigious length off the tee. Parker Owen, acclaimed prosthetic limb inventor, will be exhibiting his Cycle Leg invention at the event. Pilot Flying J is the Presenting Sponsor of the ParaLong Drive Cup, and other sponsors are Knoxville News Sentinel, All Occasions Party Rental, University of Tennessee Partners in Sports, Ability Dynamics, Troppman Prosthetics, Bridgestone Golf, HIRZL, CHAMP, Tennessee State Bank, Greg Coleman Law, ServiceMaster, Academy Sports + Outdoors, PC Restoration, Ralph Vowell State Farm, and Barnes & Barnes Salon. Special thanks goes to Jamie Stokes of TOUR VISION PROMOTIONS, Sports Animal (FM 99.1), and The Golf Director (www.thegolfdirector.com). Please contact Dean Jarvis if you are interested in participating in, or becoming a sponsorship partner of future ParaLong Drive events. MESQUITE, NV — Las Vegas is where Americans go to view the best shows, concerts and live events. The star-power and production quality is of the highest standard, all in the middle of the desert. But an hour northwest of Las Vegas is the small town of Mesquite, Nevada. With a population of more than 16,000, it has become the home to a different kind of superstar…The Long Driver. And now, the ParaLong Driver. For first-time visitors to Mesquite, a trip to the desert is an eye-popping experience. Rock formations of the most brilliant shades of red and orange frame a picture that is straight out of the Old West. Towns are miles apart with only a thin ribbon of highway cutting through the desert solitude. Cell phones may lose reception in the desert and travelers coming from long distances away may suffer a bit of fatigue … but nothing seemed to deter those who traveled from around the world to participate in the first ever ParaLong Drive World Championships. After all, they have already overcome greater obstacles. The ParaLong Drive Worlds included competitors from seven different countries (U.S., Canada, Australia, England, Israel, The Netherlands and South Africa), all competing for long drive glory. ParaLong Drive allows disabled golfers from all walks of life to challenge themselves against the best in the world, based on category of disability. The divisions for competition were paramobile, one-arm assisted and unassisted, leg below knee amputees, leg above knee amputees, vision impaired, hypermobile and traumatic brain injury hitters. The first ever women’s division also squared off on the grid. These world-class competitors are proving to themselves, the Paralympic committee and the world that golf is a universal cure to immobility. The event took place in mid-October, under perfect weather conditions. Day One began at Conestoga Golf Club in Mesquite for a friendly skills competition. Different participants had a meet and greet with each other, along with event-planners responsible for the gathering: Bryan Dangerfield (Director of Athletic Events for Mesquite, NV), Geno Withelder (Mayor Pro Tem of Mesquite, NV), Dean Jarvis (Amputee Long Drive Championship Founder) and Brad Clayton (PGA Master Professional in Teaching). Clayton, in from Oxford, NC, was also a participant in the one-arm assisted division of the ParaLong Drive Worlds and very optimistic about the direction of this event for the future. “This is just the beginning,” says Clayton. “This will grow to include more than just amputees participating in skills challenges other than Long Drive. With more people getting involved, we expect to have local qualifiers next year with Mesquite being the final stop, this will definitely become more competitive with time.” The skills competition included a chipping contest into a target as well as a putting contest around various obstacles laid out on the practice green. On the two days following the Skills Competition, the atmosphere changed. The rock music provided a lively backdrop, the hitters began blasting Bridgestone e7 golf balls into the desert and the main part of the competition took place. The venue was the Mesquite Sports and Events Complex, home of the RE/MAX World Long Drive Championship, and also home to the first united ParaLong Drive event in May. The ParaLong Drive Nationals (May 2014) included two ParaLong drivers hitting the ball more than 400 yards. Brendon Jacks, of Prescott Valley, Arizona, a below the knee leg amputee, was the first ParaLong driver to top the 400-yard mark. But his record would not last long, as Jared Brentz of Nashville, Tennessee, a double below-the-knee amputee, would best him for the title driving the ball 409 yards. Both drives drew national and international attention from the media and others in the sport, and the idea for the ParaLong Drive Worlds was born. Stemming from the Paralympic committee rejection of golf as a Paralympic sport in 2016, many hitters and fans are making the case for long drive. For some in the golf industry who complain about pace of play, long drive is the perfect solution – requiring only a 500-yard long grid and a few tee-boxes. Adam Benza, from Hellertown, PA was one of the participants in the Worlds competition. He was not only in town trying to go for a world championship title, but more to network with people like Dean Jarvis, EQ Sylvester and Brad Clayton about growing the game among people with different disabilities. Benza, 28-years old, had his right leg removed below the knee after battling Ewing’s Sarcoma as a child. A graduate of the Penn State PGM program and currently carrying a 1.6 handicap, Benza is among the best golfers with a disability in the country. 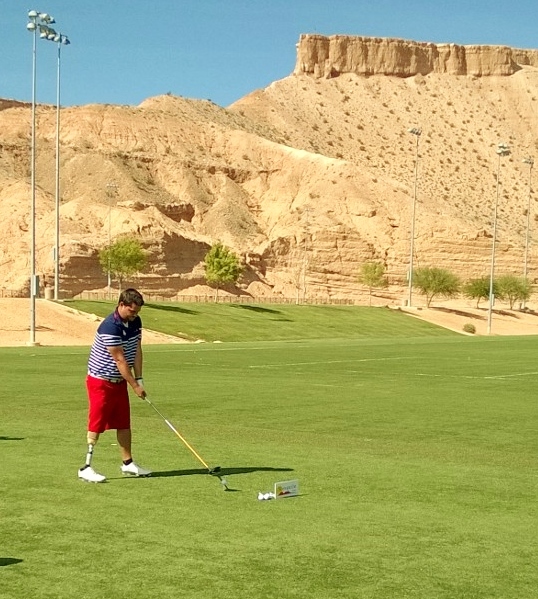 He was selected by the National Amputee Golf Association (NAGA) to represent the USA in the first ever World Disabled Golf Championships (WDGC) in Japan. The WDGC, in its first year, was designed to put the best in the world against each other in a team format, in another effort to include the game of golf in the Paralympics. More important, Benza, along with USA teammate Kenny Bonz (Farmingdale, NJ) and ParaLong Drive Worlds competitor Kellie Valentine (Erie, PA), is also planning on helping grow the game among disabled people in the Mid-Atlantic US. “The working title is Moving Foreward,” comments Benza. “The mission is to help people with disabilities learn how to play the game, and to also teach current club professionals how to properly introduce and instruct people with different disabilities.” Benza has been teaching golf for nine years, and plans on expanding the business in a similar fashion to Freedom Golf Association based in Chicago. Benza’s longest drive came on Friday, the final day of competition, where he let one fly 288 yards. While it was an improvement over his first day longest drive of 274, it was not enough to advance to the final round. Competition concluded with two world-renowned hitters squaring off to be named the first ever ParaLong Drive World Champion. Jared Brentz, who won ParaLong Drive Nationals glory in May, once again found himself competing for the title. His drive of 360 yards was the longest of all competitors going into the final round, but he would have to face Tim Herrmann, a below the knee amputee from Belle Plaine, MN. Herrmann, whose longest drive going into the competition was 373 yards, blasted a drive 325 yards in the semi-final round to advance…very impressive, but 35 yards short of Brentz’s best. The format for competition is six shots in 2:45. Almost two and a half minutes may seem like a lot, but for maximum distance, every second in the setup is crucial. 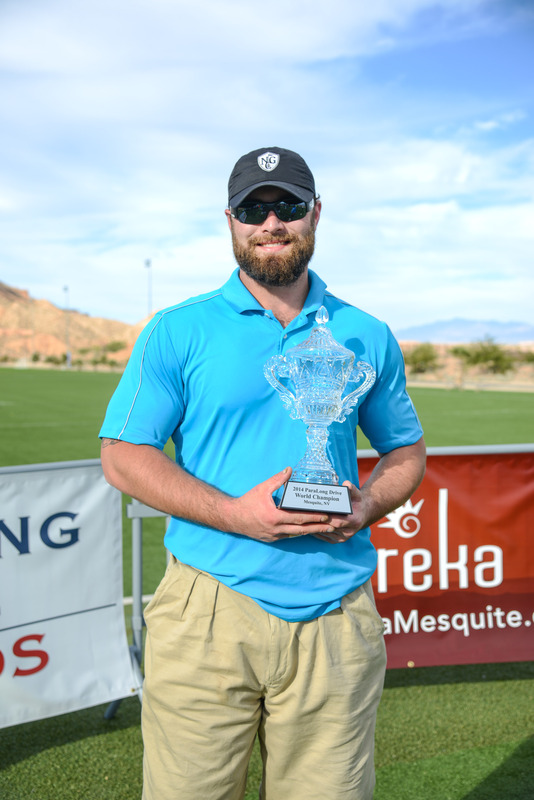 A beautiful brand new crystal trophy, presented by Golf Mesquite Nevada, and an interview with Golf Channel’s Bailey Mosier awaited the longest driver. Both men hit a few out-of-bounds, but in the end, Herrmann’s longest drive traveled 333 yards, and Brentz’s traveled 340. Brentz was then crowned the first ever ParaLong Drive World Champion. The ParaLong Drive Worlds return to Mesquite in November of 2015, and a new world champion will be crowned. For further information, find ParaLongDrive on Facebook, or go to www.paralongdrive.org.